Synopsis (from the publisher): When a building bursts into flames on a cold winter night in D.C., investigators see a resemblance to a string of recent fires in the area. There is one difference, however: This one has a human casualty. The local team insists they're looking for a young white male, suffering from an uncontrollable impulse to act out his anger or sexual aggression. 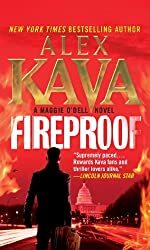 But when special agent Maggie O'Dell is called in, everything she sees leads her to believe that this is the work of a calculating and controlled criminal.